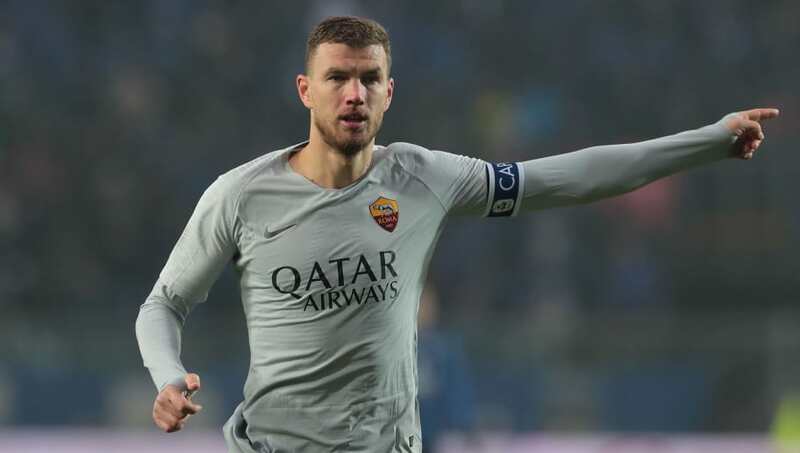 Edin Dzeko has been handed a two-match Coppa Italia ban after being sent off in AS Roma's 7-1 thrashing at the hands of Fiorentina last Wednesday. A Federico Chiesa hat-trick inspired the Viola to the semi finals of the competition, but the game was marred by Dzeko seemingly pictured spitting at match referee Gianluca Manganiello. The Bosnian forward was sent off with twenty minutes to go after making a gesture towards the referee, and in widely circulated images, it appeared that Dzeko had spat at Manganiello. However, in his official match report, ​Manganiello made no mention of the alleged spitting incident, instead stating that the former ​Manchester City star had been given his marching orders for insulting him. According to a ​Lega Serie A disciplinary statement (as translated by ​Axe Sport), Dzeko has been banned for two games for 'in the 27th minute of the second half, protesting a referee’s decision, approaching the match official in a threatening manner and making seriously insulting remarks towards him'. The ban means the 32-year-old will miss the next two Coppa Italia matches he would be available for selection for, and in addition to his suspension, has also been fined €10k. Dzeko has been an ever-present for Eusebio Di Francesco's side, scoring four times in his 17 ​Serie A appearances. In the Champions League, the Bosnian has been far more prolific, finding the back of the net five times in just four outings.